The G-Free Foodie Team thinks this recipe will be spectacular at your Grammy-watching party, St. Pat’s Day, or anytime you feel the need…thanks, Tina! To my darling husband’s credit, he was able to locate 99% of the items on his grocery list with no problems. But then he got to the bottom of the list and saw…green onions. What the heck were green onions???? College Dan had no idea. However, instead of asking a grocery store employee for help locating this mysterious item, Dan decided to figure things out on his own. How hard could it be? I laughed for days, y’all. And then I laughed again this past week when I asked Dan to pick up some baked Lays and Sun Chips for me so that I could serve them with this skinny onion dip, and I came home to discover one bag of plain Kettle Chips and another of Garden Medley Pita Chips. This time, I think he may have just misread the packaging (maybe?) – he was sincerely surprised when I pointed out to him that neither bag said “baked Lays” or “Sun Chips” on them. Anyway. 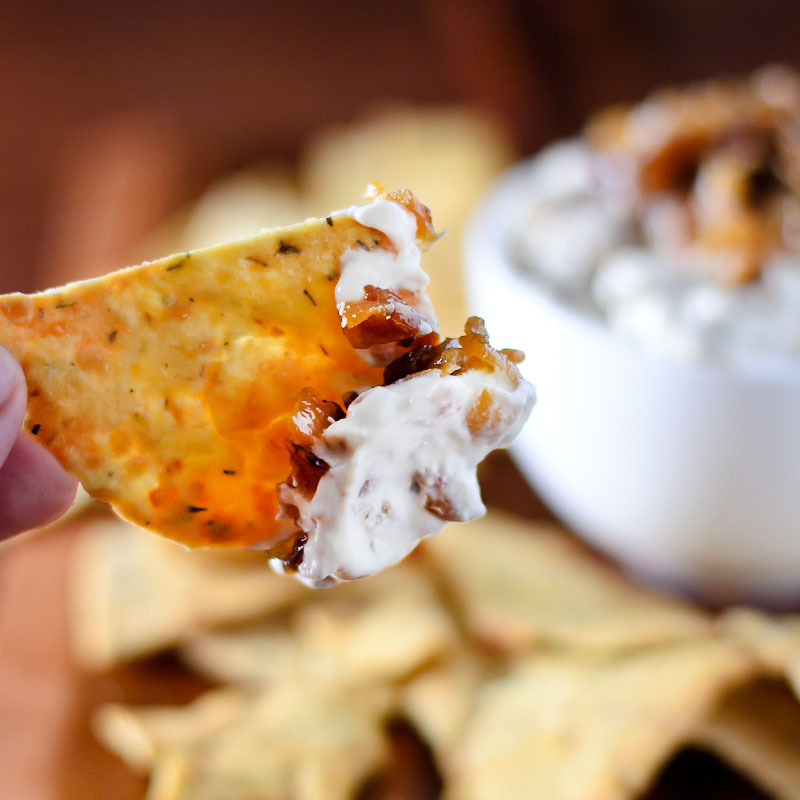 The reason I wanted baked Lays and Sun Chips in the first place was to have slightly healthier chips to go with my “skinny” French onion dip. I figure if I’m going to indulge my appetite for snacking during the Superbowl, I may as well try to be as healthy about it as possible. This dip is just what I was looking for – it tastes as delicious and indulgent as the good stuff (maybe a little more tart? ), but it won’t break my diet. Unlike traditional onion dip, this one is made with Greek yogurt instead of sour cream + cream cheese + mayo, and clocks in at less than 400 calories for the entire bowl. Not too shabby, right? Serve this with healthier baked chips and a plate of fresh veggies, and you’ll be able to fully satisfy your snack-ppetite during the big game while still feeling good about yourself. Wins all around! This dip is just what I was looking for – it tastes as delicious and indulgent as the good stuff (maybe a little more tart? ), but it won’t break my diet. Melt butter in a large heavy-bottomed pot over medium-high heat. Add diced onions and saute until well browned and caramelized (but not burnt), about 30-40 minutes, stirring every few minutes. Remove pot from heat and transfer the onions to a medium mixing bowl. Add the yogurt, salt/pepper, and Worchestershire sauce to your bowl of caramelized onions, and stir until everything is evenly combined. Taste, and season with extra salt, pepper, Worcestershire or sugar if you think your dip needs it. Serve immediately, topped with the reserved caramelized onions. This can be made ahead of time – just store it in an airtight container and refrigerate (no more than 3-4 days). This entry was posted in Appetizers & Snacks, Recipes, Recipes & Techniques by Cooks We Love and tagged food allergies, g-free, g-free diet, gluten allergy, gluten free, gluten free cooking. Bookmark the permalink.